Another great book. I must admit to a similar sensation when I first started reading Hemingway: every novel is just so good and unique and you want there to be an inexhaustable supply to last until the end of your days. Sadly, the Hemingway experience was over all too quick, but I can take some comfort from the fact that Nabokov wrote more. Obviously they will eventually run out, so, I need to pace myself and read a new Nabokov as a sublime escape every few months. I really wish I hadn’t seen the movie of The Defence beforehand, it would have made the drive towards the novel’s resoultion even more intense. So, I will not give the ending away, but it doesn’t end as cleanly, in terms of action, as it should and this is a great device, you are on tenterhooks. 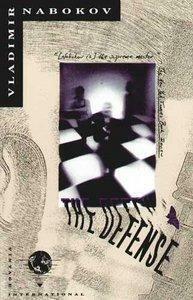 It is a very strange book, Nabokov gives us vivid scenes and then lets us fill in the gaps between these. The importance of a good back story and unresolved issues is often overlooked and I find myself still thinking about Luzhin’s mother, the auntie and the personal effects left by his father. Also, Valentinov and his activities. As with all of Nabokov’s books you really feel that he knows exactly what he is doing as a writer and that this comes effortlessly and intuitively – he is the literary Picasso of the twentieth century. Form plays an important part in this novel; the creative nature of form along with the negative are finally brought to fruition with the way conclusion manifests itself. Even the stuttering less-than-clean act at the end brings out the contradictions. What a work of art.